As a part of Village Aid’s partnership with Concern Universal, AVISU, our partner, are improving internet access to remote communities in the Northern region of The Gambia. AVISU now has it’s very own internet cafe. They have also benefited from a more established internet connection, with training in IT. This is increasing their capacity for communications, whilst also giving the local community access to IT and the internet in a region where their rural location makes this notoriously difficult. The project also aims to convene skilled software developers who are working in Gambia’s cities to donate time through organised ‘Hackathon’ events. Recently, the first ‘Hackathon’ was a great success! It brought software developers together to develop a new software for rural farmers. 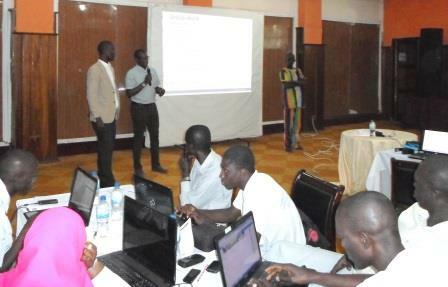 The software is a centralized database to store specific market prices in each region of The Gambia. Registered members will be able to call a local number to receive market prices for their desired item and market, whilst agents upload regular market prices through a mobile app directly from the markets. This innovative technology will ensure that farmers can access current market prices for their crops regardless of their literacy skills. Farmers also have the option of choosing which market to attend, or even delaying the harvest of their crops should they speculate a potential higher market price. There has also been the unexpected benefit of farmers being able to investigate prices of crops they intend to buy, to stop them travelling long distances to markets until there is a favourable change in price. In the future, this system could possibly be developed into a new platform to allow farmers to publish the price they are willing to sell their crop at across the whole of The Gambia, and allow farmers to effectively sell their crops at wholesale, or even establish a new wave of small wholesale businesses in rural communities. You can find out more about our work in The Gambia and our partner AVISU here, or call us on 01629 814 434. If you would like to ensure we are able to continue these life-changing projects, please donate to our work here.